Photography: exuviae of Cicadidae (Westwood, 1840) Family of insects of the order Hemiptera, suborder Homoptera Auchenorrhyncha, infraorder Cicadomorpha. Probably all of us know the cicada primarily for its particularly strong and, for some, annoying buzz audible in the hot summer days (and nights). They are males who “chirp” (emit), indeed produce this distinctive sound by vibrating membranes (timbales) located in the abdomen. The sounds vary greatly and some species are more musical than others are. These insects use different calls, although not to the human ear, depending on their aim: raise an alarm or attract potential partners. The cicadas are also famous for their tendency to disappear completely for many years and then reappear in large numbers at regular intervals. 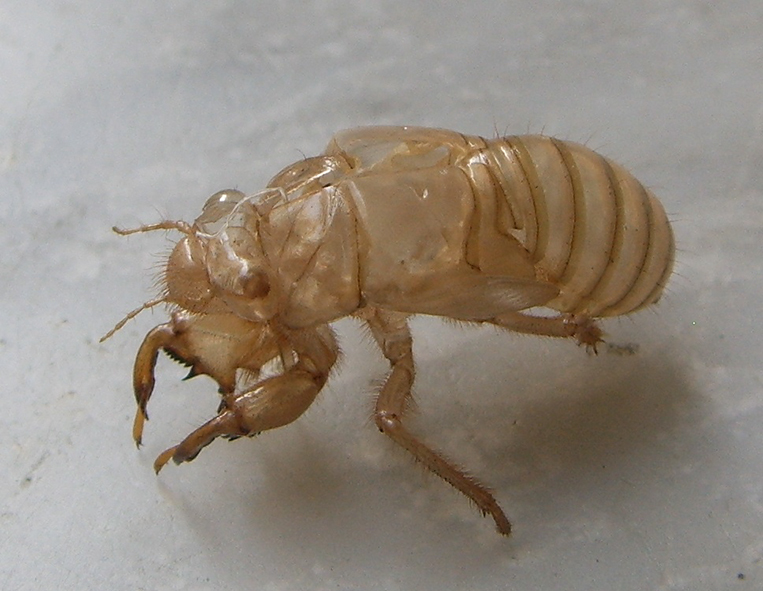 Among the more than 3,000 species of known cicada only some however fully manifest this reputation: the cicada of 17 years (Magicicada septendecim, Linnaeus 1758) is one example. These latter live as a nymph under the ground for 17 years and then, during summer, come out all-together as a given signal. Others are called annual because, although individuals have multi-year life cycles, a part of the adult population makes its appearance every year. The females lay their eggs on the twigs and immediately after hatching, the young nymphs (larvae) of cicada penetrate the soil where they feed on liquid sucked by plant roots. After the first life stages, which can last for years, in these underground burrows, they rise to the surface as young individuals very similar to the adults but still without wings, they climb trees and complete their life cycle by making the moult: they abandon the nymphal casing and, after a few hours, they are ready for the first flight. What we find on the trunks of trees a few decimetres from the ground is the exuvia [term used in biology to describe the remains of an exoskeleton after moulting of an arthropod (insect, crustacean or arachnid)], which I friendly call the ghost of the woods. chirp, cicada, exoskeleton, exuvia, larvae, nymphs, sound, timbales.